We have two CDs available. 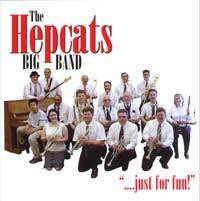 To order, just send your name and address to hepcatsbigband@gmail.com . The price is only $12 each. We’ll send a stamped, pre-addressed envelope with the shipment of the CD so you can send us a check. Our second CD, “One More Time!”, has a number of songs featuring our vocalist, Lou Anne. You’ll love her work, as do we. This CD has a number of your favorites … String of Pearls … Tuxedo Junction … Lil’ Brown Jug …Pennsylvania 6-5000 … and many more! It’s sure to take you back to the good old days.